The photograph of Cadet George Allcroft printed in the Grantham Journal of the 30th November 1918. Report of Cadet Allcroft's death and funeral, from the Grantham Journal of the 30th November 1918. The three Allcroft family headstones in St Mary's graveyard, Bottesford. 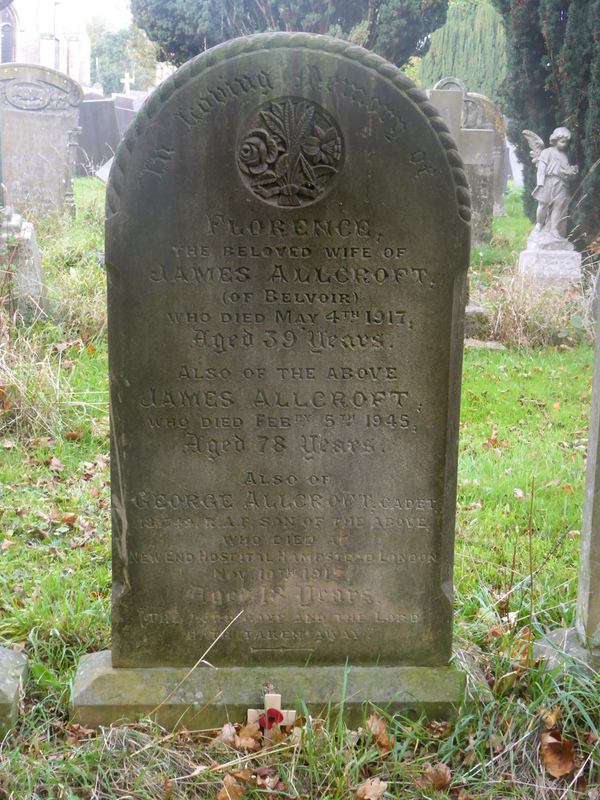 Gravestone commemorating James and Florence Allcroft, and their son Cadet George Allcroft who died in 1918, aged 18. Detail of the lower part of the Allcroft gravestone, marking the burial of George Allcroft with his parents. Cadet George Allcroft’s death on the 10th November 1918 is another example, if one was needed, of the tragic ironies of the Great War. Like his father, he was a gamekeeper employed on the Duke of Rutland’s estate. 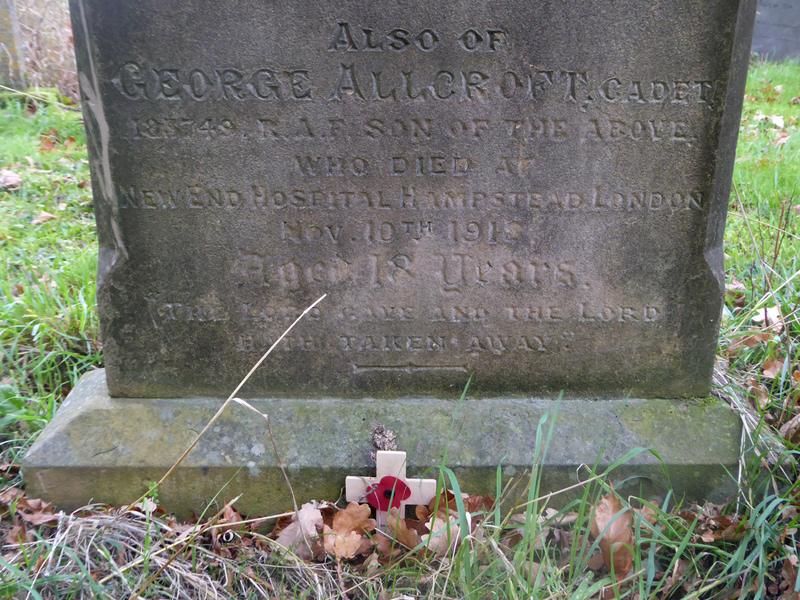 He enlisted on the 1st October 1918, a month short of his eighteenth birthday, but died in the military hospital in Hampstead after catching influenza less than six weeks later, on the day before the Armistice was signed and the war ended. George’s grandfather, George Allcroft, was a gamekeeper born in Diseworth, Leicestershire, in 1836. His grandmother was Jane, nee Potter, who was born in Newton le Willows, Lancashire, in 1830. They were married on 6th November 1859 at St. Simon, Liverpool. Their first child, Charles Edwin, was baptised on the 1st March 1862 at Great Witley, Worcestershire. In 1881 he was living in Acton Burnell and working as a gamekeeper. He married Anastasia Dawson at Atcham, Shropshire in 1890, and they moved to Wood Ditton, Cambridgshire, where they were in 1891 with a baby daughter, Martha Mary. Charles was recorded again in the census of 1901, now a widower living with Martha at Walford in the parish of Bishop’s Wood – still at work as a gamekeeper. In 1911 he was at Paddock Cottage, Coughton, Ross-on-Wye. Charles died in September 1929 at the age of 66, his death registered in Hereford. James Allcroft, the second son, was born at Weston Heath (Weston under Redcastle), near Hodnet in Shropshire, between 1868 and 1872 (there is some inconsistency in the ages he gave to the census enumerators). He had a sister named Mary Jane Allcroft who was born in 1869 in Hodnet. She was 12 years old in 1881 when she and James were recorded with their parents at Lion Lodge in the parish of Ingestre, near Stafford. In 1897 she married William Palin in Basford, Nottingham, but by 1911 Mary Jane was widowed and had moved to Newcastle-under-Lyme, Staffordshire, with her children Hilda, Ida and Leila. In 1891, James was still living with his parents George and Jane at an address somewhere close to the Belvoir Inn, though he may also have lodged with Mark and Eliza Porter at Easthorpe Lodge in Easthorpe. He and his father were both gamekeepers at Belvoir Castle. Sadly, George Allcroft died the following year, 1892. In July 1897, James married Florence Maude Cotton in Nottingham. She was born in Grantham in 1878. In the 1901 census, the family living at Belvoir comprised James Allcroft (aged 32), Florence Maude (23) and George junior, who was just 5 months old. James had become the Duke’s gamekeeper and the Allcrofts lived at the Keeper’s Lodge. The 1911 census again records the Allcrofts living at Belvoir, James Allcroft still in position as the Duke’s gamekeeper. Their children, all at school, were George (aged 10), Florence Margaret (aged 8, born on 23rd November, 1902) and Florence Violet and May, both aged 5, presumably twins born in 1906. Florence Maude Allcroft died in May 1917 and was buried in the churchyard in Bottesford. In her will, which was administered by her daughter Florence Margaret Goodson (wife of John Edward Goodson) only in 1945 after James had died, she left effects to the value of £105.11s.3d. George Allcroft junior was born 30th October 1900 at Belvoir. He became an RAF cadet on the 1st October 1918, a month before his eighteenth birthday. His Service Number was 183749. 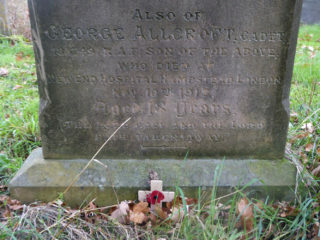 He died on 10th November 1918 at New End Military Hospital, Hampstead. His death, due to influenza, was registered in Hampstead, and his body was brought back to Bottesford for this funeral. The funeral on November 25th 1918 was reported by the Grantham Journal on the 30th November with an obituary tribute which states that he had a quiet and retiring nature and had been employed as assistant game-keeper at Croxton Park. He had voluntarily joined the Royal Air Force, and been stationed at Fitz John Avenue, London. “ … The funeral took place at Bottesford with full military honours, on Monday afternoon. The coffin was met at Bottesford railway station by the M.G.C. [Machine Gun Corps, based at Belton Park] Band and firing party from Grantham. The funeral cortege proceeded through the village to the churchyard to the sirsins of the “Dead March” from Saul. The Rev. F.W.Knox, chaplain to his Grace the Duke of Rutland, officiated, assisted by the Rector of Bottesford (Rev. F.Walford). … ”. 1 Fitzjohn’s Avenue, London NW3, is currently the RAF 48F (Hampstead) Squadron Air Training Corps TA Centre, after 100 years in service as an RAF establishment. Cadet Allcroft’s grave is listed by the Commonwealth War Graves Commission, and is thus an official war grave. In the 1939 register James Allcroft was recorded as retired, living at 47 Main Street, Redmile. His twin daughters Violet Florence and May, born on 17th May 1905, lived with him, both unmarried. Violet Florence died in Hinkley, Leiestershire, in February 1992, aged 86. May Allcroft died in September 1994, aged 89, her death registered in Leicester. James Allcroft died 5th February 1945 in the National Defence hospital in Grantham. He was buried alongside his wife and son at Bottesford. In his will, administered by his daughter Florence Margaret Goodson, he left effects to the value of £2642 17s 7d. Interestingly his late wife Florence’s will was not administered until James had died. Florence Margaret Allcroft married John Edward Goodson in the first quarter of 1928. She died March 3rd 1978, aged 75, her death registered in Melton Mowbray. John Edward Goodson was born on 28th July 1906, and died in June 1962. The 1939 register records that he and Florence Margaret had then lived at Coal Wharf Cottage, close to Muston Gorse, where they had a small holding and kept poultry. 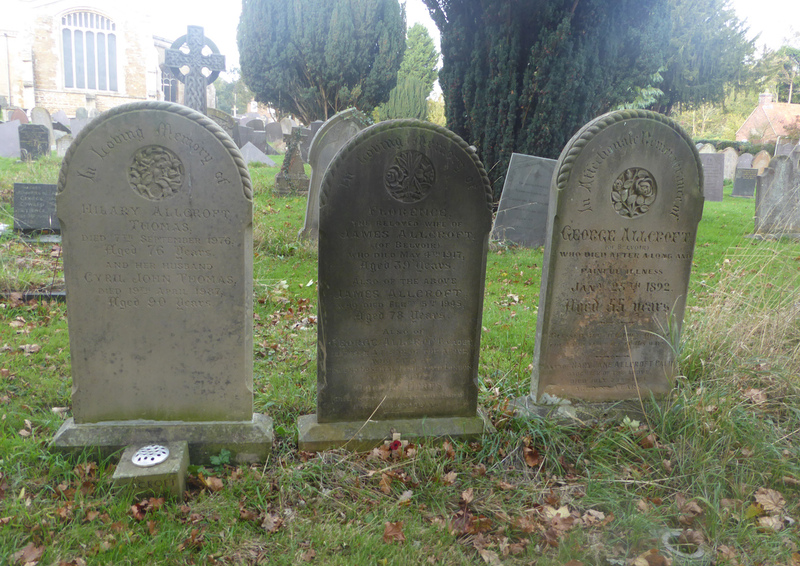 Three Allcroft headstones stand close together in Bottesford graveyard. The middle of the three marks the grave of James and Florence Allcroft and their son George. To the right is the grave of James’ father George Allcroft, who died in 1892 “after a long and painful illness”, and his daughter Mary Jane Allcroft Palin, who died in 1951. The left hand stone marks the grave of Hilary Allcroft Thomas who died in 1976 and her husband Cyril John Thomas who died in 1987. The stones share the same handsome design and were probably erected by members of the family during the 1980s in loving memory. Died while in training in England.